» Who knows who killed Jakhob? Who knows who killed Jakhob? 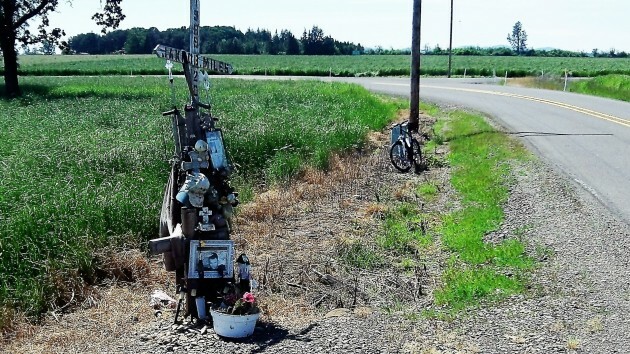 As roadside memorials go, this one is sadder than most. It reminds us that for more than seven years now, someone has gotten away with taking the life of Jakhob Miles. Jakhob had lived in Albany since he was 10. When he attended Calapooia Middle School, he was into computers and music and won an achievement award. Then, in 2008, when Jakhob was 19, someone shot him dead. On the morning of Sept. 11 that year, his body was found by the side of Kamph Drive, a few steps from its junction with Murder Creek Drive. Prompted by the roadside memorial, I wrote about the case exactly three years ago, on May 16, 2013. Last week a bike ride took me past the spot again, and as you can see, time and the Oregon elements have done their destructive work. 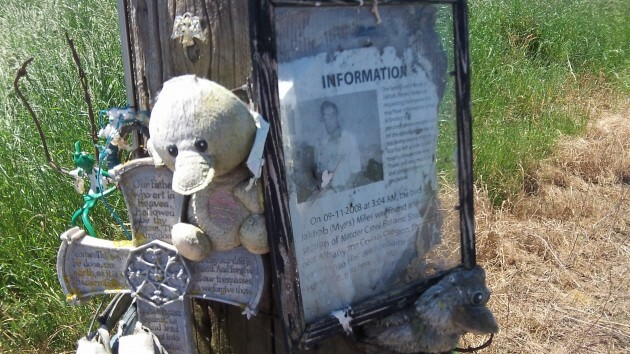 But the shrine is more than a memorial to young Jakhob. Although the photo and printing are badly faded, they continue to appeal for information about who is responsible for his death. In 2013 the Linn County Sheriff’s Office still treated the homicide as an active case, but it was at a dead end until someone came forward with new information. Now, the situation remains the same. Thank You for remembering my nephew. Please if anyone has any info, speak up. Someone knows something, someone bragging about or anything. Give our family the closure that we all need! Extremely sad. And a reminder why it is so necessary for people to step forward and work with law enforcement. Only together can we help make our society safer.